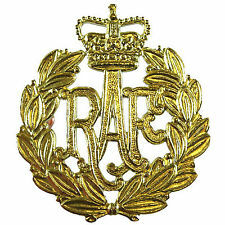 RAF cap badge, believed to be of WW1 type. Fred Pacey is one of the men named on the Bottesford ‘chuch list’ of WW1 Servicemen. Frederick Pacey was born probably on the 4th May 1890, and baptised on the 13th June 1890 at Woolsthorpe by Belvoir (though his military service record gives his date of birth as the 22nd June 1890). His parents were William Pacey, an ironstone labourer born in 1868 at Woolsthorpe, and Hannah A. Pacey, born 1869 at Great Gonerby, Lincolnshire. Fred was William and Hannah’s first child. He was admitted to Woolsthorpe Primary School on the 26th November, 1904. William and Hannah (born Frances Ann Clay) were married in 1889 at Grantham. In 1891, William and Hannah lived on Mill Lane, Barrowby, with baby Frederick. They were to have a large family. In 1901, they lived at Woolsthorpe, and William had become a ‘plumber & grazier’. By this time they had seven children: Frederick (10 years old), Charles (8), Frank (6), Sarah E. (5), William (3), Henry (2) and Walter (less than a year old). Then, by 1911, they had moved to 4 Easthorpe Lane, Bottesford. Charles Pacey had emigrated to Canada, but Frederick, Frank, Sarah, William and Walter were still living at the family home, together with two later children, James (8) and Albert (6). Out of the eight boys, five would enlist during WW1. Two lost their lives in the fighting. Frank Pacey died of wounds sustained while fighting with the 1/5th Battalion of the Leicestershire Regiment on the 21st April, 1916, near Ypres. Charles joined the 8th Battalion (the 90th Winnipeg Rifles), part of the Canadian Expeditionary Force, but was tragically killed on the 2nd December 1916 at Vimy Ridge, less than a year after his brother. The other three, Frederick, William and Walter, all survived. Frederick Pacey enlisted on the 6th September 1917, joining the Royal Navy, as AMII (Air Mechanic) F37285, giving his civilian occupation as a motor mechanic. His RN record sheet indicates that he was based at President II (Crystal Palace), Cranwell, Felixstowe and finally at Prees Heath (RAF). He served in the RNAS (the Royal Naval Air Service) before moving to the RAF in 1918. His RAF Service Record sheet indicates that he was in the RNAS from the 6th September 1917, then became part of the RAF on the 1st April 1918, on or about the date it was set up following the merger of the RFC with the RNAS. He was transferred to the RAF Reserve on the 27th February 1919 and discharged on the 30th April 1920. His RAF service number was 238285 and his rank Air Mechanic II. His next of kin was given as his father Wm Pacey, Easthorpe. It is not known how much time he spent time at sea or overseas, nor is it known which medal were awarded to him. Little information has been found regarding his life after leaving the RAF in 1920. He had married back in 1911, not long after the census date, to Jane Parr. In 1928, Kelly’s Directory for Leicestershire includes William Pacey & Sons, plumbers, telephone Bottesford 3, in its list of businesses based in Easthorpe. In 1932, after William’s death, the reference had changed to Jas. Rt. Pacey. In 1934 the business was recorded as William Pacey (telephone Bottesford 313), and in 1941 it was William Pacey & Sons. Clearly, the business was well established and successful. However, in the 1939 register, Frederick Pacey was recorded as a master plumber living at 1 Wilton Road, Melton Mowbray, with his wife Jane and their daughter Marjorie (born on the 6th November, 1920), who was still ‘at school’ even though she was nineteen. It seems likely that at some point he set up on is own in Melton, but there is no information as to when this may have taken place. Frederick’s father, William Pacey, died in 1929 in Grantham district (details have not been located). His mother, Frances Ann Pacey, died in 1942, aged 73, and was buried at Bottesford on the 23rd December, close to the grave of her infant son Henry. Jane Pacey died in 1946 in the Grantham area. Frederick died in 1954 also in the Grantham area, aged 64.